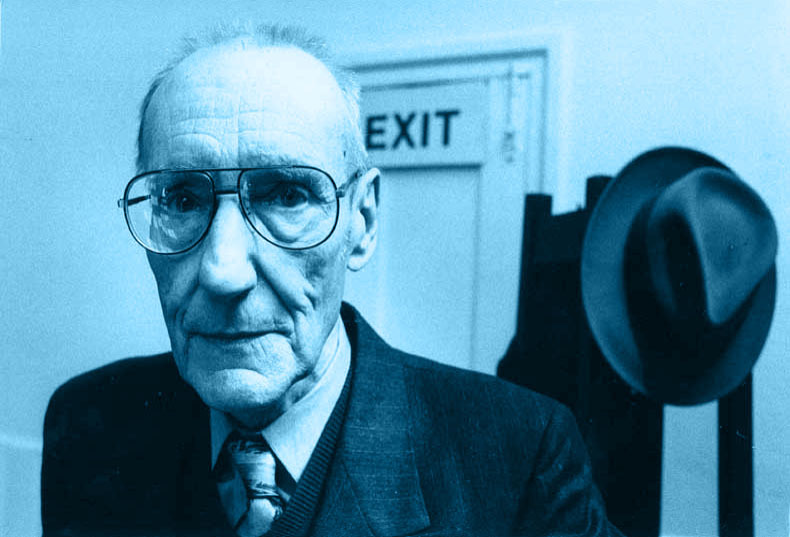 So… what do we know about Bill Burroughs? Not to be confused with Bill Borrows, writer of the Loaded generation who now does stuff for TalkSport. Famously shot and killed his wife during a drunken game of “William Tell”, which involved him trying to shoot a glass of gin off her head, at a party round a friend’s house in Mexico. Tried to bribe his way out of it but ended up just legging it back to the states. I tried to read The Naked Lunch once but it kept making me fall asleep. I also fell asleep watching the movie version, so the book was literally a narcotic, in my case at least, which seems fitting. We were in Paris for the 2009 ‘Naked Lunch @ 50’ homage, on the 50th anniversary of its publication (a mate of ours was doing his Lord Buckley show as part of the celebrations). I discovered that the book was originally described as ‘disgusting,’ ‘pornographic’, ‘un-American trash’ and ‘unpublishable’, but reading it on the way there I quite enjoyed it. At the end of a seminar of learned Burroughs-ologists I pointed out that, in an episode of The Simpsons, Nelson went to see the movie and came out saying, “I can think of two things wrong with that title”. Then I got my coat. It does indeed, though Burroughs’ work was a treatment of Alan E. Nourse’s 1974 novel ‘The Bladerunner’, entitled ‘Blade Runner (a movie)’. The band names ‘Steely Dan’ and ‘Soft Machine’ also came from Burroughs’ writings. The term “heavy metal” is a chemists’ one – but as applied to music, it comes from The Soft Machine. Assorted late 60s druggy bands also quote from that book; notably The Rolling Stones (Sister Morphine) and The Velvet Underground (Waiting for the Man). The film of The Naked Lunch made a valiant attempt at an unfilmable book, I thought. But I was in an enhanced condition when I watched it. My favourite Soft Machine fact is that when Robert Wyatt quit he called his next band Matching Mole, from the French for Soft Machine (Machine Molle). Their second album was produced by Fripp (without Sylvian). R.I.P. Daevid Allen.Founder member of The Soft Machine. He asked William Burroughs if it was ok to name the band thus. Old Bill said I don’t see why not. I wrote a letter to Burroughs when I was in high school and he actually wrote back; my closest brush to celebrity I guess ..